Technavio has published a new report on the global agriculture machine to machine market from 2017-2021. 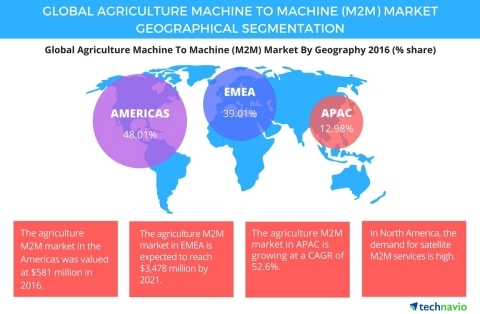 LONDON--(BUSINESS WIRE)--The global agriculture machine to machine (M2M) market is expected to grow at a CAGR of more than 47% during the forecast period, according to Technavio’s latest market research. In this market research report, Technavio covers the market outlook and growth prospects of the global agriculture M2M market for 2017-2021. The market is further categorized into four application segments, which include equipment control and monitoring, crop management, environmental monitoring, livestock farming and fishery management, and smart logistics. “M2M technology is a crucial enabler for the rapid transformation of the agricultural sector toward smart farming. These technologies help in remote connectivity between the sensor networks in the farms and information management systems. These sensors help in environmental monitoring, food traceability, and land management,” says Rohan Joy Thomas, a lead m2m and connected devices research expert from Technavio. Large-scale deployment of long-term evolution (LTE) network infrastructure is driving the agriculture M2M market in the Americas. The adoption of equipment control and monitoring solutions will contribute to the growth of the market. In addition, the evolution of new business models from telecom operators (VAS and bundled services) is propelling the market. In North America, M2M communications such as smart meters for hydro, bridge toll devices, and climate control technologies have greater opportunity and are driving the market. In Latin America, the agriculture M2M market is growing due to the increasing population and uncultivated land. The increasing population is forcing the farmers to bring about good yield of crops, and using agriculture M2M solutions helps in improving productivity. For instance, agriculture M2M-based equipment monitoring application and irrigation sensors are used in blueberry farms in Chile. The sensors are implanted in the soil to monitor the irrigation needs and demand for water, thereby optimizing the use of water remotely. The agriculture M2M services market in EMEA is expected to grow steadily during the forecast period, driven by increased demand for M2M solutions for applications such as weather forecasting and monitoring and tracking of crops. In a few African countries, including South Africa, Kenya, and Nigeria, M2M technology is widely deployed in applications such as equipment control and monitoring solution, crop tracking, point of sale (POS), and insurance. Also, some of the African governments have passed regulations to enforce the smart monitoring of electricity and water meters, thereby increasing the use of M2M systems in the agriculture sector. “M2M technology offers farmers an opportunity to pick and collect data from sensors connected to production machinery, dam level, livestock, vehicles, or soil moisture monitoring. Keenan along with Vodafone has introduced an M2M application to monitor livestock feeding machines. This real-time information allows farmers to offer more consistent food rations to animals, to ensure better milk production,” says Rohan. The increasing penetration of high-speed broadband networks is expected to drive the M2M services market in APAC. Japan dominates the market in APAC. Increasing global demand and supply for agricultural products provide an opportunity for Japan to obtain its productivity and export goals. However, there is an increasing adoption of cellular M2M in emerging markets, especially in China, India, and South Korea, that reflect the proportion of labor force in agriculture and the requirement to increase productivity in emerging markets. In India, Ossian Agro Automation introduced a mobile-based remote-control system for agricultural water pumps called as Nano Ganesh. Through this device, farmers can control the pumps remotely, check the on/off status of the water pump, and check the availability of power supply. With the installation of Nano Ganesh system, farmer or end-users can save 1,000 liters of water, a liter of petrol and at least three hours of time per day. The global agriculture machine to machine (M2M) market is expected to grow at a CAGR of more than 47% during the forecast period, 2017-2021.